This theme article needs cleanup. Please review Wikiquote:Templates, especially the standard format of theme articles, to determine how to edit this article to conform to a higher standard of article quality. You should also check this article's talk page to see if the person who added this message left an explanation there. Only an easy scramble remained and we were there, on the hitherto untrodden summit of Nelion. Written by Krapf in his diary on 1949-11-26, the day he found out of the existence of a second, and still larger, Kiima ja Jeu [mountain of whiteness] [than Kilimanjaro]. The sky being clear, I got a full sight of this snow-mountain... It appeared to be a gigantic wall, on whose summit I observed two immense towers [Batian and Nelion], or horns as you many call them. These horns, or towers, which are at a short distance from each other, give the mountain a grand and majestic appearance which raised in my mind overwhelming feelings. Written by Krapf in his diary on 1849-12-03 when the weather finally allowed him to see Mount Kenya for the first time. Krapf interviewed a man from Embu about the mountain in 1851; this description suggested that the mountain might have glaciers and permanent snow. As I stood entranced at this fulfillment of my dearest hopes … I am not very sure but there was something like a tear in my eye. 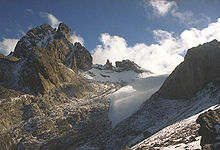 Thomson was the second European to see Mount Kenya. By the time he did some people were beginning to doubt Krapf's reports. Thomson accurately inferred the geological history of Mount Kenya from a distance. Count Teleki's expedition was the first European one to set foot on the mountain. The quote describes the view during the approach. The Kenia crater must be from 10,000 to 12,000 feet in circumference, and the bottom, which is pretty uniformly covered with snow and ice, is some 650 feet lower than the rim. Count Teleki misinterpreted the volcanic plugs of Batian and Nelion to be the highest point on the volcanic crater rim. Because this expedition had been on the mountain this interpretation of the landscape was believed over Thomson's correct one as he had only gazed upon the mountain from afar. It was eighty miles away from us, but it stood out sharp and clear on the eastern skyline. ... my interest was roused; for its grooved and rounded surface suggested that it had been carried to its present position by ice. It was hard to believe at the time that ice could have come as low as 3,000 m (10,000 ft) on the equator. Another trait of the Zanzibari character was shown at the same camp. In the morning the men came to tell me that the water they had left in the cooking-pots was all bewitched. They said it was white, and would not shake; the adventurous Fundi had even hit it with a stick, which would not go in. They begged me to look at it, and I told them to bring it to me. They declined, however, to touch it, and implored me to go to it. The water of course had frozen solid. I put one of the pots on the fire, and predicted that it would soon turn again into water. The men sat round and anxiously watched it; when it had melted they joyfully told me that the demon was expelled, and I told them they could now use this water; but as soon as my back was turned they poured it away, and refilled their pots from an adjoining brook. Gregory's porter Fundi refused to go scrambling; Gregory had to do the first ascent of Mount Höhnel alone. Then, with his hands together before him, he [Fundi] began to pray... he thanked Allah for having enabled him to come where neither native nor white man had every been before, and to stand on the edge of the great white fields he had seen with Dachi-tumbo [Count Teleki] from afar. He assured Allah that he was now more anxious to return in safety to the coast than he had ever been before, so that he might tell his friends of the wonders he had seen. Fundi was Gregory's favourite porter and the first African to reach the glaciers on Mount Kenya. He [Fundi] put on the boots—under protest, but absolutely refused to keep them on. As he also declined to allow me to put nails into the soles of his feet (his hide would probably have held them),... whatever snow-work was necessary would have to be done alone. The mountain-top is like a stunted tower rising from among ruins and crowned by three or four low turrets, upon which we sat, feet inward... We dared, however, stay only forty minutes—time enough to make observations and to photograph—and then had to descend, not from any physical inconvenience due to the elevation, but for fear of the afternoon storm. Halford Mackinder description of reaching the summit on the first ascent of Mount Kenya in 1899. It is an eyrie. It is pitched on the brink of the precipice. Eric Shipton made the first ascent of Nelion and the second ascent of Batian in 1929. Few mountains have such a superb array of ridges and faces. Shipton was climbing with the novice Bill Tillman on the first ascent of the difficult West Ridge Route up Batian. Dutton is describing Melhuish skating on the Curling Pond below the summit of Lenana. Felice Benuzzi was an Italian mountaineer held in a British prisoner of war camp at the base of Mount Kenya. This was his first view of the mountain which had remained hidden in cloud during the wet season. 'Now wait and you will see,' said Giuán... 'See what?' 'Batian. It is so marvelous that you will just sit down and stare.' He was right and we did. Felice Benuzzi, Giovanni Balletto and Enzo Barsotti escaped to climb Mount Kenya in 1942. They did not know the names of many of the peaks. Above Benuzzi describes their first view of Sendeyo and Terere. Before their escape, Felice Benuzzi, Giovanni Balletto and Enzo Barsotti had to construct or find all the equipment they needed for a serious mountaineering attempt. They got well established onto the west ridge of Batian with this equipment. Above approximately 4,000 m (13,000 ft) the temperatures drop below freezing every night, but duing the day the equatorial sun is strong. ↑ Johann Ludwig Krapf (1860). Travels, Researches, and Missionary Labours in Eastern Africa. London: Frank Cass & Co. Ltd. pp. 545. ↑ a b c Joseph Thomson (1968). Through Masai Land (3 ed.). London: Frank Cass & Co Ltd.
↑ a b Lieutenant Ludwig von Höhnel; Count Samuel Teleki (1894). Discovery of Lakes Rudolf and Stefanie. London: Longmans. ↑ J. W. Gregory (1921). The rift valleys and geology of East Africa. London: Seeley, Service & Co. Ltd.
↑ Hastenrath, Stefan (1984) (in English). The Glaciers of Equatorial East Africa. Dordrecht, Holland: D. Reidel Publishing Company. ISBN 90-277-1572-6. ↑ a b c d Eric Shipton (1977). That Untravelled World. Illustrations by Biro (2nd edition ed.). London: Hodder and Stoughton. ISBN 0-340-21609-3. ↑ a b c d Felice Benuzzi (2005). No Picnic on Mount Kenya: A Daring Escape, a Perilous Climb. The Lyons Press. ISBN 978-1592287246. ↑ O. Hedberg (1969). "Evolution and speciation in a tropical high mountain flora". Biological Journal of the Linnean Society 1: 135-148. This page was last edited on 13 June 2016, at 14:54.